The Denver Nuggets are coming off of a game in which the Golden State Warriors annihilated the Nuggets. Denver was dominated early on and could not find a way to overcome the defending champions as DeMarcus Cousins had a season-high 28 points. With the loss, the Warriors built a two-game lead on the Nuggets and essentially locked in the first seed in the Western Conference which allowed the Houston Rockets and Portland Trail Blazers to move closer to the second seed in the West making things very interesting for Denver in their final five games. 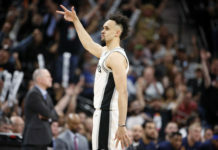 Every game matters from here on out and the Nuggets responded against the San Antonio Spurs on Wednesday evening with a masterful game that Denver won 113-85. The matchup started with San Antonio’s future Hall of Fame head coach Gregg Popovich getting ejected in 63 seconds into the first quarter, but not without leaving the Pepsi Center with one of the most memorable moments of the season. With that, I give you the good, great and awesome. To be clear, basically everything went right for the Nuggets. Denver returned back to the Pepsi Center and continued their strong play at home, improved to 11-1 on back-to-backs, won the game by 28 points, and it all began with Denver’s excellent start. 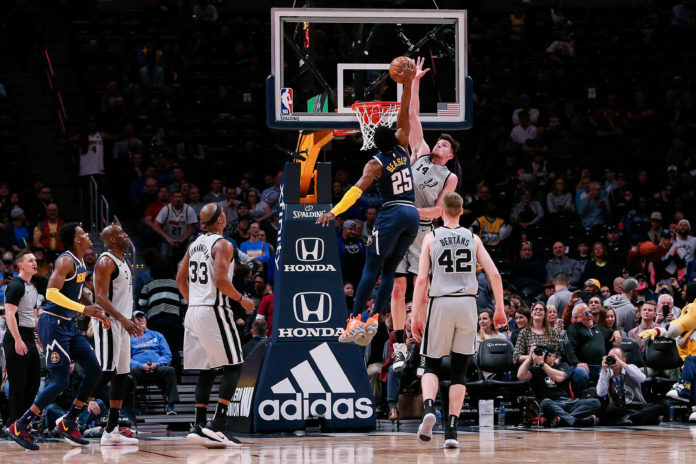 It is impossible to say if Denver was upset with the way that their offense has looked as of late, how badly they played against the Warriors on Tuesday night, or if Popovich’s early antics inspired the team, but the Nuggets came out with a flare that has not been there in a while. Denver’s offense looked stagnant against the Warriors and they only had 23 assists in the game, but in the first half alone against the Spurs, Denver had 22 assists and made it a point to find one another more often than they have in the past couple weeks. In the five games prior to Wednesday’s game, Denver had fallen to the worst shooting percentage in the entire NBA, but with how they played against San Antonio, they got back to having fun, getting others involved, and that is why they went into the half with an 18-point lead. Jokic had 12 points in the first half and also had eight rebounds and four assists while Jamal Murray had a solid first half stat line of 12 points, three rebounds, and eight assists against zero turnovers. With Denver’s two most reliable players getting off to a great start, it was easy for the Nuggets to set the tone early. Denver has to duplicate that success for the rest of the season and hone it in time for the playoffs. Denver was very unselfish with the ball and as a result it was one of their most convincing wins of the season. 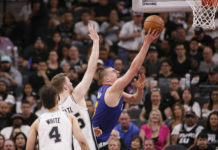 Jokic was just an assist short of a triple double as he finished with 20 points, nine assists and 11 rebounds on the night going an ultra-efficient 9-10 from the field. He was not his usual self in Tuesday’s game against the Warriors and made sure to get back on the right track by being aggressive from the opening tip. Murray also had a bounce-back night. He distributed the ball in a way that got the offense flowing while also finding his own offense in a way that he has not lately. He finished the night with 14 points, 11 assists and six rebounds. Will Barton and Gary Harris both added 11 points on the night with Paul Millsap also defending at a high level. The second unit also got involved as Monte Morris and Malik Beasley both had incredible nights. Both of them finished with 19 points as they knocked down three 3-pointers a piece and also recorded a steal. When Denver is this locked in offensively and distributing the ball as they were on Wednesday, coupled with solid contributions from the bench, they are a very tough team to beat. Having them this dialed in for the final four games will surely have them locked in as the second seed out West and ready for their playoff push. Denver came out and did exactly what they needed to do as they buried the Spurs by 28 points; yet, the man of the night was Popovich. 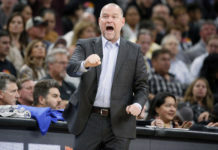 The Spurs head coach came into the Pepsi Center and ruled the night as he gave some amazing quotes to reporters prior to the game in which he complimented both Malone as well as Jokic. Popovich said that Malone is an obvious coach of the year candidate and was even higher on Denver’s Serbian All-Star. Then, Popovich had one of his moments. It was not from the opening tip, but it was darn close. The Spurs coach made history when he was kicked out of the game in only 63 seconds after complaining about calls. Initially, he complained about what he deemed a missed call, but then took a timeout and continued to argue with the ref after receiving his first technical. When he didn’t leave the ref alone, he was sent back to the locker room with his second technical and an ejection. Without their coach, the Spurs looked out of it and the Nuggets steamrolled San Antonio. But Popovich’s night was not done as the Hall of Famer did not leave without dropping this gem appearance on his way out of the door. On a night that the Nuggets won so convincingly, it was Popovich that stole the show.